There are many ironies found within this central section, only a few of which I have time to list below in this post, but two great ironies come immediately to mind: first, ever since Jesus' arrest in the garden began in chapter 18, no one has been an advocate of Jesus' kingship, but in this section, John portrays Pontius Pilate, the Roman governor, as being a ruler over the Jews, a "world ruler" of sorts, able to apply the heaviest punishment upon evildoers, the punishment of death; and in John's narrative, this world ruler is the only sincere advocate of Jesus' Kingship. This is especially noticeable when set in contrast with the second irony, that the chief priests refuse to enter the Praetorium where Jesus and Pilate privately discuss His kingship. John even tells us why they refused to enter the Praetorium. John says that "...it was early, and they [the Jewish Leaders] themselves did not enter into the Praetorium so that they would not be defiled, but might eat the Passover" (John 18:28). It was because of their own misunderstanding and distortion of God's Law that a firm belief developed about God disqualifying them from eating the Passover lamb, had they entered "unclean" space among the Gentiles. 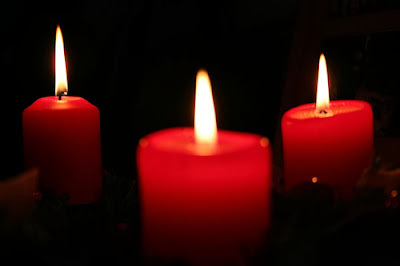 These kinds of man-made traditions were so precious that their eyes became blinded to who Yahweh really was, and by the time their Messiah arrives on the scene, they cared more about slaughtering and eating a literal lamb in God's sight than they did betraying and slaughtering the "Lamb of God who takes away the sins of the world" (John 1:29, 36). The way John compacts all of this together in chapters 18 & 19 is really interesting. Jesus has been arrested in a garden, examined in a courtyard, and now he's dragged out into the world, outside the courtyard, to be crowned by a world ruler and presented back to the Jews as "your King" (John 19:14). The "chief priests" (18:35) accuse Jesus of "doing evil" (18:30) in order to justify handing Him over to this world ruler to die (18:31-32). They would crucify Jesus themselves, but empirical Law won't allow them to do so (18:31). John also makes a point of telling us that this day of crowning and slaughtering Jesus was also the "Day of Preparation of the Passover" (19:14). So then, while the chief priests stay back in the "courtyard", they think they are spared from defilement in preparation for Passover; but little did they know that by handing Jesus over to Pilate they were defiling themselves by handing over the Lamb of God with hands full of innocent blood. The narrative gets even more interesting once we see what goes on inside the Praetorium. While the chief priests stay outside, Pilate engages in two private discussions inside with Jesus. Pilate asks Jesus if He is the King of the Jews (18:33), which is an odd question in and of itself unless rumors had already spread throughout Judea about Jesus being the King of the Jews. Jesus' response to Pilate's question is also kind of odd. Instead of answering with a simple 'yes' or 'no', Jesus responds in a way which makes Pilate affirm His kingship (18:36-37). Pilate also asks Jesus what evil He has done to deserve being handed over by the chief priests, and Jesus responds, again somewhat oddly, by talking about His kingdom. By affirming that He has a kingdom, He infers that He is a King. By affirming that His kingdom is not "of this world" (ek tou kosmou), He is inferring that His kingship originates outside of and rules beyond Jewish aristocracy. In other words, Jesus answers Pilate's question negatively about being the "King of the Jews," while at the same time maintaining positively that He is indeed a King who has a Kingdom that is not of Jewish, or "this-worldly" origin. Jesus even repeats Himself, clarifying some of what we might consider to be ambiguity of meaning, saying that His kingdom is "not from this world" (18:36). In the second discussion with Jesus, Pilate asks Jesus where He, not His kingdom, is from, and Jesus gives no answer (19:9). Pilate informs Jesus that he has the authority to crucify or release Him, but Jesus reminds Pilate what it means for His kingdom to not be "of this world." Jesus informs Pilate that he would have no authority over Him unless it had been given to him from above (19:11); therefore Pilate is really off the hook as far as ultimate authority is concerned, and the Jewish rulers have the greater sin for preparing Him for slaughter. Pilate then offers to release Jesus in the place of an insurrectionist named Barabbas. Pilate doesn't want to be the "bad guy," and so he declares Jesus' innocence and then appeals to the Jewish rulers to choose between Jesus and Barabbas. By appealing to the Jewish rulers to make a decision, the blood is on their hands. Interestingly, the name Barabbas means "son of the Father," but when given the choice between releasing a false son of the Father or the true Son of the Father, the Jewish rulers choose the false "son." This irony only adds to the contrast between Pilate's intentions and the chief priests. 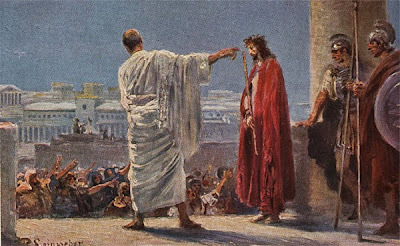 After each discussion inside, Pilate goes outside to defend Jesus, declaring Jesus' innocence publicly three times, saying "I find no guilt in Him" (18:38; 19:4, 6, sections C & C' above). By seeking to release Jesus, Pilate takes upon himself the role of a high priest, releasing a scapegoat on the day of atonement, the day in which Jesus would atone for the sins of the world. By publicly confessing Jesus' innocence three times, John also portrays Pilate as a type of Peter who makes a greater confession in all three places where Peter had the opportunity to, but instead denied his Lord. As a greater confessor, Pilate is portrayed as a "good guy" who, above all the people in chapter 18 & 19, seems to actually treat Jesus as a true King, a true world ruler whose authority is not vested in Jewish aristocracy. Pilate wants to release Jesus and He knows there is something significantly wrong with the situation he is in. He knows Jesus doesn't deserve death. He knows Jesus is considered a king of sorts in the eyes of some Jews, and so he shames Jesus by scourging and presenting Him before the Jews in mock-coronation fashion. Jesus is crowned with thorns and arrayed in a purple robe, a royal robe of glory worn by people of nobility. Jesus is even mocked by Pilate's officers, hailing Him as the "King of the Jews." Over and over again Pilate wants to release Jesus, but the Jewish rulers won't stop pressuring him until Jesus is slain. By handing Jesus over to Pilate, along with his repeated declaration of there being no blemish of evil in Him, the chief priests are portrayed as the ones who prepare the paschal lamb to be slaughtered on the Day of Preparation. Toward the end of all these events with Pilate going inside and out, again and again, John tells us that Pilate finally brings Jesus out and sits down upon a "seat of judgment" in a place called "The Stone Pavement." Here the Greek is ambiguous, leaving at least the grammatical possibility that Pilate sat Jesus down in the "seat of judgment." Regardless of who actually sat down in the judgment seat, whether Pilate or Jesus, the overall scene of Jesus with Pilate, two "world rulers" together, at the judgment-seat is really the main picture John is portraying for us. Here at the judgment-seat, John tells us that the place of this final scene of judgment was called "The Stone Pavement." In Greek this "Stone Pavement" is lithostroton, and is found elsewhere in Scripture, and in a passage that would be very familiar to first century Jews. In II Chronicles chapter seven we find Solomon dedicating the Temple, and in verse 3 Yahweh is described as descending in glorious fire upon His House with the people of Israel bowing down with their faces to the "stone pavement" (lithostroton) before Him. In John's narrative, the King of the world stands before Israel, scourged and bloody, crowned and robed in purple, but they won't bow down with their faces to the stone pavement before Him. They act as though they are in the judgment-seat, saying things like "He ought to die because He made Himself the Son of God" (19:7). When faced with a choice of releasing a "son of the Father," they release an insurrectionist. When faced with acknowledging their king on the stone pavement, they cry out, "We have no King but Caesar!" (19:15). When faced with a choice of remaining clean and eating the Passover or defiling themselves by crucifying the Lamb of God, they shout, "Away with Him, away with Him! Crucify Him!" (19:15). The rulers of Israel think the Son of God ought to die, even though there truly was no guilt found in Him. They think they're purging leaven from their house in preparation for Passover, but what they're actually doing is leavening another lump. They think they're preparing for the angel of Yahweh to pass over their house, but what they're actually doing is preparing the blood of the Lamb to be spread upon the doorposts of new "house" prepared by His Father, a house made of disciples of Jesus, filled with the Spirit of God and fed with the flesh and blood of Jesus, fed with true meat and drink indeed.